Sri Lanka has become one of the world's preferred tourist destinations for those desiring a breathtaking holiday experience. From endless beaches, ancient ruins, great surfing and lush green mountains to famous tea and food, Sri Lanka allows you to combine an array of unique holiday activities within hours from each other. If you’re looking for unlimited adventure in limited time, what better way to tie it all together than quick and comfortable air travels? Cinnamon Air is a Sri Lankan domestic airline, operating from a dedicated terminal at the Bandaranayke International Airport to destinations around Sri Lanka. Cinnamon Air’s fleet consists of two Cessna 208 Amphibian aircraft (seating eight passengers each) and one wheeled Cessna 208B Grand Caravan (seating 8 passengers in an executive configuration) that gives Cinnamon Air the flexibility to operate from any of the Domestic and International airports in Sri Lanka. 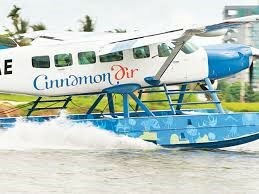 Cinnamon Air currently operates daily scheduled flights to Colombo (Waters Edge and the Bandaranaike International Airport), Kandy, Batticaloa, Trincomalee, Dickwella, Koggala, and Sigiriya. Cinnamon Air also operates private charters and scenic flights upon request. Helitours is a domestic airline in Sri Lanka operated by the Sri Lankan Air force. It is currently the second largest airline in Sri Lanka with a fleet of 16 aircraft behind Sri Lankan Airline's 23. The airline will resume its international flight from Colombo-Ratmalana to Male by the first quarter of 2013. Cosmos Aviation has developed unique tour packages for those with a yearning for a personalized aviation adventure. Their fleet comprises of all new aircrafts and is flown and maintained by the best Pilots and Engineers in Sri Lanka.